Soul Rebels Sessions big spring show is a huge global music fiesta…..from Africa to Brazil via the UK! KOG & The Zongo Brigade, led by singer/musician Kweku Of Ghana, have been making Afro-fusion music now for over half a decade. With longtime collaborator rapper Franz Von plus an all-star band featuring musicians from Mansion Of Snakes/Slow Lorris, they fuse traditional Ghanaian music and instruments with Afro-dancehall, electronica and hip-hop. 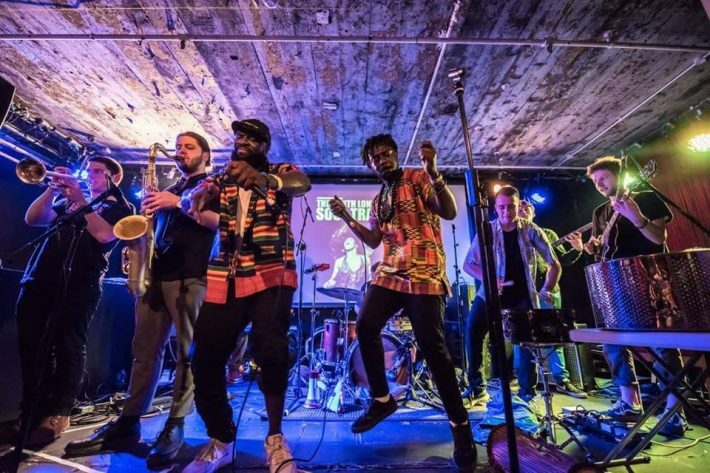 With appearances across the UK and Europe including WOMAD Festival, Glastonbury Festival, Edinburgh Jazz Festival and Millau Jazz Festival France, they launch their debut LP “WAHALA-WAHALA (Joy Frrom The Struggle)” on Heavenly Sweetness Records tonight in Leeds as part of a UK promo tour (LP out 8th March). Come and get some Ghana vibes/Afro-fusion from the UK’s original masters. Brazilian samba, Caribbean steel pan music, Afro-Latin jazz and UK electronic beats including garage, drum & bass and broken beats. Ones to watch from Leeds in 2019. Leeds Samba are the city’s much respected and loved Brazilian samba school. Led by percussion master Gez Heb and Brazilian samba dancer Thali Bento, this 10 piece samba drum ensemble are now one of the top samba schools in the north of England. They’ll be doing a samba set between between the bands and giving us an authentic flavour of Rio Carnival which closes tonight in Brasil. Soul Rebels DJs Lubi & Chris will keep the night bouncing between live bands with their usual global soul/international sounds selection….past, present and future.